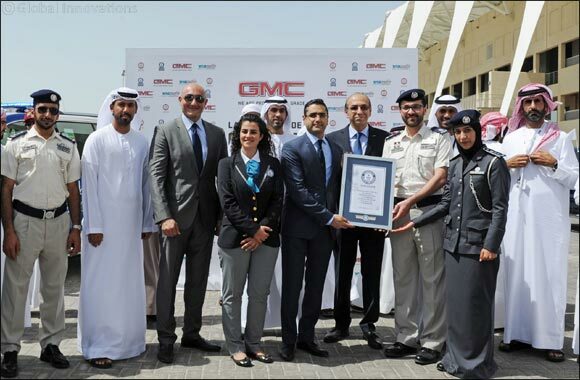 Abu Dhabi, UAE, March 15, 2018: As part of the GCC Traffic Week (11-15 March), GMC Middle East set a new GUINNESS WORLD RECORDS title, for the ‘largest parade of GMC cars’, in partnership with Abu Dhabi Police. Held at Yas Marina circuit in Abu Dhabi, 191 GMC vehicles gathered to form over a four-kilometer long parade on the famous Formula One race track. The parade was led by a 2018 6.0L V8 GMC Sierra Denali which valiantly pulled a 30-meter flag displaying a photo of the late Sheikh Zayed, to commemorate the UAE’s Year of Zayed. The world record title was officiated by representatives from Guinness World Records and successfully accomplished by GMC customers and members of the GMC UAE Club who proudly showcased their own models on the track. Representatives from Abu Dhabi Police, GMC Middle East and Bin Hamoodah Auto – GMC dealer in Abu Dhabi - were on the ground to support the record-breaking event. In line with the continual efforts by the UAE authorities to improve traffic and reduce accident rates, the event aimed to shed light on traffic risks while raising awareness of road safety among motorists in the UAE. “On behalf of GMC – globally, regionally and locally – I would like to thank Abu Dhabi Police and our local partner in Abu Dhabi Bin Hamoodah Auto for making this outstanding achievement possible. GMC is all about professional grade and we always strive to make extraordinary achievements to further enrich the brand’s heritage”, Sbeih added. GMC Middle East, broke its own GUINNESS WORLD RECORDS title for the largest GMC parade which was previously set by Mohammad Saleh and Reza Yousuf Behbehani Co. – GMC dealers in Kuwait. Held on 3 November 2012, GMC Kuwait gathered 181 GMC vehicles at the 7th Ring Road, in Kuwait, setting a record of the largest parade of GMC cars. GCC Traffic Week is a unified campaign by GCC countries which aims to improve driver safety. Taking place from 11th - 15th March 2018, the week features multiple programs and communications raising awareness and providing guidance on safe driving.